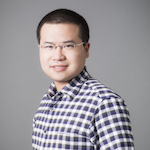 Han Wang joined Ming Hsieh Department of Electrical Engineering as an Assistant Professor in August 2014. He received the B.A. and M.Eng. degrees in electrical and information science, both with highest honors, from Cambridge University, England, in 2007 and 2008. He received his PhD degree from Massachusetts Institute of Technology in 2013. From 2013 to 2014, he is with the Nanoscale Science and Technology group at IBM T. J. Watson Research Center in Yorktown Heights, NY. His research interests include the device technology and novel circuit applications of two-dimensional (2D) materials including black phosphorus, graphene, hBN, MoS2, WS2, etc., with emphasis on exploring both the fundamental understanding and new applications of novel nanomaterials in ubiquitous electronics, THz electronics, plasmonic devices, energy efficient applications, and interaction with biological systems. His past research also includes GaN-based III-V HEMTs for high power millimeter-wave applications and Si power electronic devices. His work has been recognized with multiple awards including the Roger A. Haken Best Paper Award in IEEE International Electron Device Meeting (IEDM) 2012, MIT Jin-Au Kong Best Doctoral Thesis Award 2013, International Conference on Compound Semiconductor Manufacturing Technology (CS MANTECH) 2010 Best Student Paper Award, Cambridge University Agilent Prize and numerous fellowships. Dr. Wang has authored or coauthored more than 50 publications in distinguished journals and conferences. His work has been reported by Nature, Science, Nature Materials, IEEE Spectrum, EE Times and ACS C&E News. Science and technology of novel nanomaterials, e.g. black phosphorus, MoS2, WSe2, graphene, hBN, etc. New materials for THz electronics and power electronics application.